8th Grade Parents- Don't forget to visit the EWG Apparel and Raffle Table during the 8th Grade Parent Night on March 21. Raffle baskets include: "EWG Swag Basket," "Freshman Year Starter Pack," and more! Reminder that Spring Sports start Monday, March 18th: Volleyball should report to the high school gym for a 2:00-3:30 practice. Track should report to the Multi-Purpose Room at 2:00. Baseball will practice at 6:30 in the high school gym. Softball will have a 3:30-5:00 practice in the high school gym. Lacrosse will be announced by the coach. Location/time subject to weather. Tennis will be announced by the coach depending on weather. Juniors interested in a possible career as a medical assistant, pharmacy technician, process technologist or horticulture & landscape technician can apply for an apprenticeship opportunity by April 15th at www.prepare-ri.org/apprenticeships See your counselor or Mrs. Mayne for details. Parents are you interested in learning more about the scheduling process? Are you interested in the types of opportunities available for your child to take? Come join the school counselors to learn more on March 19th at 6:00pm in the library. MidKnight Madness: Friday, March 22nd from 6pm to MidKnight! We start off with some games in the gym, then move to the auditorium to see the Drama Club's opening night of "Freaky Friday" and then "the games begin." T-shirts are being sold now for $10 which covers everything! Parents- stop by the Class of 2020 Raffle Table during Parent-Teacher Conferences on Thursday, March 7 from 5-7pm in the Sr High lobby. Raffle includes various themed baskets and assorted pastry platters. All proceeds support the Class of 2020. Seniors interested in "free" tuition at CCRI MUST file the FAFSA to be eligible. Attend a FAFSA Completion Night at CCRI for help. Available dates (starting at 5:00PM) are March 14 (Warwick), March 19 (Lincoln) and March 27 (Providence). See guidance for more information. Parent Teacher Conferences March 7th, 5-7pm EWG is using PTCFast.com to make signups as convenient as possible. Please enter the following web address into your browser window: https://www.ptcfast.com/schools/Exeter_West_Greenwich_Jr_Sr_High. To sign up for meetings. Vaping , Substance use, Technology issues, School Anxiety and other pertinent topics tonight in the high school Library start time is 6:00pm. Friday is the last day for interested juniors to apply for the PrepareRI internship program! Please stop by guidance for a QR scan card linking you to the application if interested! Congratulations to Nikolas Angell, Malinda Fry and Nick Powers on passing the DriveWorksXpress Training and Certification and becoming ‘Certified DriveWorksXpress Associates’! This is a great achievement as they join an elite group of the only 5 high school students in the WORLD to have achieved this certification. Way to make EWG proud!! It is that time of year again for school alerts regarding closings due to weather. However, the RIBA system is used for other school closings as well. If you have not signed up for a text or email alert, the following link https://my.textcaster.com/asa/Default.aspx?ID=6d6b22e1-242f-46b3-ae4f-e01582e9a14c can be used. This is our method of letting you know when school is closed or delayed. You can also find the information on turnto10 or your favorite local stations. We begin exams this Thursday, 1/17. They run up and including next Wednesday 1/23. Monday, 1/21 the school is closed. Please plan to pick up your students from 11:00 AM on each day of exams. They should be in silent study each day in the library and will be released when you arrive to pick them up. If you are not here right at the close of each exam session, just text them when you arrive. If you have any questions, please feel free to call or email. Parent conferences will be held on March 7 from 5-7 at the high school. There will be more information when the date gets closer. For planning purposes, April 9, 2019, all grade 10 students will be taking the PSAT and the grade 11 students the SAT and must report to school at the regular time. Both tests are mandatory state assessment requirements. The students taking the SAT and PSAT will be released at the completion of the testing period. Lunches will be available at the end of the session and students may take the regular scheduled buses at 1:37 if they do not have a ride when the testing period is over. Grade 9 students will have the day away from school and may use the time to complete some of their graduation required 10 hours of community service. Our Grade 12 students will also have time away from school and they may use choose to complete any loose ends on their senior projects they will be presenting in May. All teachers will be available should either group need any support. Are you a senior planning to attend a post-secondary school in the fall? Complete the FAFSA (www.fafsa.ed.gov) now to determine your financial aid eligibility. The CCRI Promise scholarship requires this step to qualify. The RI Association of Emergency Managers is looking for a HS student to design the logo for their upcoming conference "Rhode to Recovery". Designs are due by January 31st. See Guidance for more information. Are you a senior unsure of what you are doing after high school? Are you interested in a career in shipbuilding at Electric Boat? See Mrs. Mayne in the guidance office for more details about an exciting FREE opportunity! Happy Thanksgiving to all of our EWG families. EWG is collecting donations of food and clothing, items can be delivered to the senior high office. Thanks for your support in helping Student Council and Owen's Eagle Scout project. Bank of America Student Leaders®, has just launched their application for the upcoming year and is hoping to recruit high school Juniors and Seniors through this partnership. The Student Leaders® program helps connect 225 community-minded high school juniors and seniors from across the country to employment, skills development, and community service. Five Rhode Island students are selected locally and awarded a paid summer internship with a local Boys and Girls Club and participate in a national leadership summit in Washington, D.C. The Student Leaders Summit focuses on skill building and creating a more civically engaged society. Students with a passion for leadership, a need to build confidence, or simply a desire to improve their community should check Naviance for details. Today Juniors learned about paid summer internship opportunities as part of the PrepareRI initiative. Interested students can see Mrs. Mayne in guidance for application (which opens December 3rd) information. Join Mr. Ward and Mr. Krom on Monday evening, starting at 6:30PM, in the auditorium for an informal Q&A around financial aid and sending students off to college. DID YOU KNOW?....Using e-cigarettes and other vaping products is not a proven method for quitting smoking. E-cigarettes and other vaping devices would be a preferred alternative to traditional cigarettes when used exclusively as a replacement and only among smokers who have been unable to quit smoking using proven, medically approved methods. 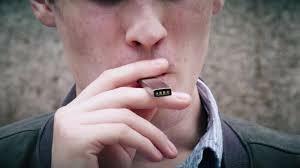 However, there is little evidence that they reliably reduce cigarette smoking or lead to smoking cessation. In fact, the nicotine contained in e-cigarettes and other vaping products may actually perpetuate addiction, in some cases making it even harder to quit smoking. DID YOU KNOW...Vapes contain nicotine, a highly addictive drug with known health risks. Using nicotine, regardless of how it is delivered, increases the risk of addiction. Nicotine addiction is notoriously difficult to reverse, and use of e-cigarettes frequently leads to use of other nicotine products, including smoked cigarettes, as well as alcohol and other drugs. It takes a village to keep our children safe. Let's work together to teach our children the deadly results of bullying... BIRMINGHAM, Ala. (WPMI) — A 9-year-old girl from Birmingham, Alabama who'd been bullied in school hanged herself Friday and died at the hospital Monday, according to an AL.com article. Fourth grader Maddie Whitsett serves as a reminder to all parents. Teach your children not to bully others and look for warning signs that suggest your child is a victim. As a school, we will do our share too. Talent show tonight, 11/14, in the auditorium at 6:30 PM. Report Cards have been published! You should have received an email informing you of this. Sign into Aspen today to view this information. Blood Drive on Wednesday in the Multi Purpose Room 1:30 to 5:00 pm. A representative from the Community College of Rhode Island will be visiting on Monday the 19th at 8:40am. Students interested in learning more about the Promise scholarship should sign up to attend the presentation in Naviance by Friday the 16th. Bryce Mitchell would like to thank the EWG School community for all the donations and help with his senior project. As a result of his hard work and your support, he raised a total of $281.66 for the Wounded Warrior Project. On Friday, 11/9, we will have another early release day for the purpose of professional development. The high school students will be released at 11:37 AM. Lunches will be served before dismissal. Families are invited to attend a College Financial Aid Workshop, hosted by Senator Jack Reed, on November 19th at 6:00pm at CCRI in Warwick. Come learn about the financial responsibilities associated with college and what opportunities may be available to you. Spring registration is now open in the ACN GoSignMeUp portal. You and your student can access the course selection at http://RIcoursechoice.org. Registration is open from Oct. 29th through December 23rd for FREE Spring courses. For more information, check out the NEWS section. Next Friday, 11/9, we will have another early release day for the purpose of professional development. The high school students will be released at 11:37 AM. Lunches will be served before dismissal. The end of the first quarter is fast approaching. Next Friday, 11/2, we will be half way through the first semester. Before you know it, graduation day (June 15, 2019) will be here. Remember we have academic support every Monday and Wednesday (Knight School) in the library. Mr. Ward and Mr. Krom will be hosting a college drop in informational night on Thursday, October 25th from 5-7 pm in the guidance office. Attention all Boys and Ghouls!! The 13th Annual EWG Spooktacular is this Friday, Oct. 26, 2018 from 5:30-7:30. There will be music, snacks, hula hoop contest and our superb chamber singers. Our famous art contest, face painting and more. What Parents Need to Know About The Latest Teen Vaping Trend! SPEAKER: Robert Hackenson Have you heard of vaping? Have you heard of JUULing? Your kids have! Come to our parent night on October 30, 2018 at 6:00 PM in the Jr/Sr High Auditorium and See Through the Smoke. Learn the truth about vaping and get the facts. What to look for and what information you should talk about with your teen. The following six EWG students were accepted to the 2018 All New England Band, held this November 19 at Plymouth State University in New Hampshire: Lauren Boss, Trombone Ben Gurnon, Percussion Aidan Horan, Tuba Alex Jedson, Alto Saxophone Hannah Rae, French Horn Joe Sirr, Trumpet Congrats! Mark your calendars! The Senior High Debate Team is sponsoring a Family Movie Night on Friday, November 2. We'll be screening a family film in the Senior High School Auditorium at 7:00. Admission is free! Concessions will be available for purchase -- all proceeds will benefit Debate. What's the movie, you ask? We would like some feedback from the community. Please fill out this form to vote: https://goo.gl/Q2AkCi and we will screen the most popular choice. See you next month! Tomorrow, 10/18/2018 is an early release day. The buses will be picking up students at 11:37AM after they have had their lunches. Parent conferences are from 12-2 and 5-7. Juniors don't forget to register to take the PSAT on October 24th! The test provides customized SAT practice through Khan Academy and qualifies you for National Merit scholarships. Looks like it may be chilly for our Spirit Day activities on the football field Friday afternoon. Everyone should wear layers to keep warm. The committee has organized a really fun afternoon for everyone. Saturday night is our Homecoming Dance. The dance is from 6-10PM. Students may leave the dance at 9:30. It looks like it is going to be a great night for the dance. This Friday night 10/19 is our Homecoming Game under the lights! Please come out and support the Knights as they do battle under the lights provided by our booster club. Kick off is 7 PM. GO KNIGHTS! This week is Spirit Week. This is all about school spirit. Each day has a different theme, but the one theme that should never change is the core value theme of kindness. Enjoy the week! 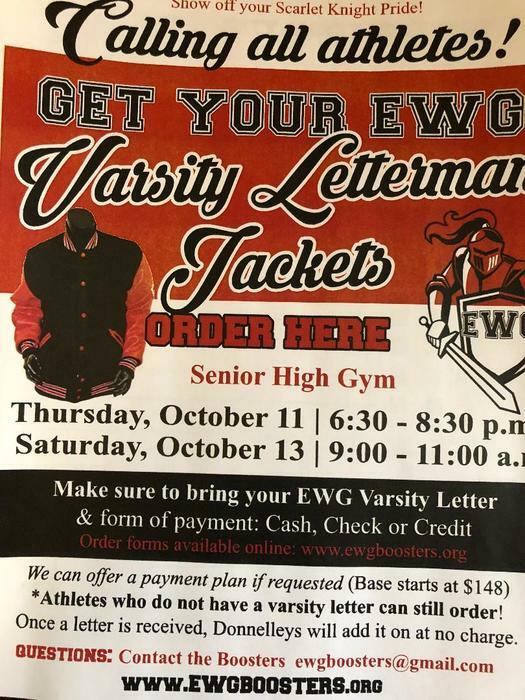 October 12 Stay informed Parents/students/staff they can stay informed of updated community announcements by clicking on the community announcements link below: https://www.ewgrsd.org/o/ewgrsd/browse/39124 Get your EWG Varsity Letterman Jackets last day to order is tomorrow. Spirit Week 10-15 to 10-19 Monday Meme/Vine Day Tuesday Hawaiian Day Wednesday Character Day Thursday Pajama Day Friday Class Colors ALL school rules apply. No masks, facepaint, hats, and all outfits must meet dress code. Homecoming dance will be hosted on Saturday, October 20th. Tickets on sale during all lunches. The Newspaper Club will be selling paper chain links for all grade levels now until Thursday, October 18th. The advisory that contributes the most to the chain will be awarded a pizza party sponsored by the Newspaper Club. Paper chain links cost $1 or your can buy three links for $2. Stop in room 203 to buy one or see a member of the newspaper club before school or during lunch. See Mr. Walsh if there are any questions. There will be a math honor society meeting Monday, Oct 15th at 1:45 in room 109. There will be a brief meeting for parents of juniors on Tuesday, October 16th from 6:30 -7pm in room S21. The purpose of the meeting is to give parents an overview on upcoming class fundraisers. Pizza and refreshments will be served. See Mr. Walsh in 203 if there any questions. Get your EWG Varsity Letterman Jackets last day to order is tomorrow. A representative from the University of New Hampshire will be visiting next Tuesday. If interested sign up to attend in Naviance. Interested in Architecture, Construction or Engineering? Register now for ACE at www.acementorri.org First meeting is next Wednesday the 17th at NEIT. The program is a great opportunity to learn and experiment with career professionals and can lead to a college scholarship. Get involved today! Any DECA members interested in attending the RI DECA Fall Leadership conference at Johnson and Wales on Friday, October 26 need to contact Mr. Krom or MRs. Kennedy by next Tuesday, October 9th for registration. The next EWG Chapter of DECA will meet on Oct 9th in room S208. Homecoming dance will be on Saturday, October 20th. Tickets are on sale during lunches. Tickets are $15 dollars each and must be purchased in advance. The Robotics club next meeting will be held on Tuesday, Oct 9th after school in room 204. New members welcome. See Mr. Murphy for details. Message from Ms. Davis for seniors in Group 2, your fieldwork journal entry 1 is due tomorrow. Varsity Letterman's Jackets on sale. Parent teacher conferences are on October 18th, the times are 12 noon to 2:00pm and 5pm to 7:00pm. EWG is using PTCFast.com to make signups as convenient as possible this year. Please enter the following web address into your browser window: https://www.ptcfast.com/schools/Exeter_West_Greenwich_Jr_Sr_High If you do not have internet access, please send your student in with requested times to their teacher. Don't forget to check Naviance to see what colleges are visiting! Johnson & Wales will be here tomorrow and Salve Regina on Friday! Interested in Robots? Come join EWG very own Robotics team. Create, build and program your own unique robot and then test your skills against top schools in the state at a regional competition held at NE Tech. First meeting will be held this coming Monday, Oct 1st. See Mr. Murphy for more details. Spirit Day at EWG High School is coming up on Friday, October 19. The high school has traditionally had a pep rally on this day. We are looking forward to doing that again this year. As teachers, we have been discussing ways to make Spirit Day a fun, positive experience for all students and to create a spirited school culture. We will be having a meeting after school for students who are interested to learn more about what will be happening on Spirit Day. The meeting will be next Monday on October 1 after school. Students received an email about the meeting today. We'd love to get as many students involved in the conversation and planning as possible so please encourage your child to come to the meeting next week! Drivers Education Session 1 Oct 15, 16, 22, 25, 30, Nov 1, 5, 8, 13, and 15. The times are 2:15 - 5:50. Session 2 Nov 19,20,26,29, Dec 3,4,10,13,18,20. You must sign up at CCRI website. There will be an informational meeting for the math honor society Monday, Sept 17th at 1:45 in room 113B. The first newspaper club meeting will be held on Tuesday, Sept 18th in room 203. All welcome to attend. See Mr. Walsh with any questions. High school Jazz Band rehearsals will begin next week, on Tuesday, September 18. Be here for 6:30 am! For more information, see Mr. Charest. Please join the School Improvement Team (SIT) the first meeting will be held on Thursday, September 20th at 6:00pm. Meetings take place on once a month on Thursdays. Meetings last 1 hour. You are invited to join the Chamber Singers! We are having auditions after school today. All you have to do is sing any song of your choice. You only have to sing 1 verse and 1 chorus of the song- it will be short. Join the Chamber Singers we meet every Monday and Wednesday from 1:45 to 2:30. There will be a freshman class council meeting, Tuesday, September 11th in room S21. Anyone interested in joining should attend. Student Council meeting this Monday the 10th in room 215. Old and new members welcome. The first informational practice meeting for the EWG Math Team will take place this Monday in room 102 September 10th. Please consider joining us to hear more about some healthy math competition. NHS application workshop on Monday Sept 10th. The Cross Country Team needs volunteers to direct runners at their first home meet on Tuesday, Sept 11th. Volunteers will receive 2 hours of community service. Contact Olivia Johnson or Coach Mastroianni if interested. The first junior class council meeting will be held on Tuesday, Sept 11 in room 203. All are welcome to attend. See Mr. Walsh with any questions. The first newspaper club meeting will be held on Wednesday, Sept 11 in room 203. All are welcome to attend. See Mr. Walsh with any questions. Seniors are getting ready for Senior Project presentations on Friday. We are looking forward to seeing their hard work showcased.